Foamhenge is Unique and a Fun Place for Kids - This is where I started my misadventure. Foamhenge was built by Mark Cline. 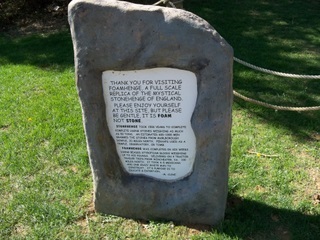 Be sure to read the whole story on one of the stones. There he shares how the original Stonehenge in England took an estimated 600 to 1000 men 1500 years to build and place the stones. 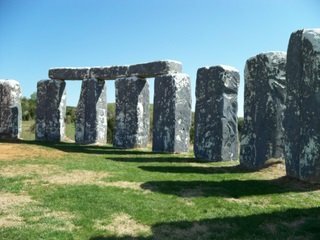 Mark and his crew completed the Foamhenge in 6 weeks using beaded Styrofoam blocks weighing up to 400 pounds. It's purpose is to educate and entertain. Be sure to have good walking shoes! It is quite a hike to the top of the hill! Before I started climbing I wondered why they had 2 benches 1/2 way up the hill. NOW I know it was for folks like me to rest! A Special Thank You to Frannie in Lexington, Va! My guardian angel! Read further to see the whole story. 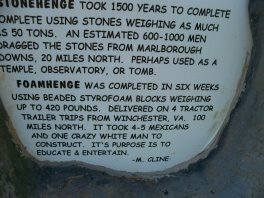 OK..It is April and I have been trying for the last 4 months to make it to the Natural Bridge area to visit Foamhenge and other sites. I live in Richmond Va. This Saturday April morning I get up at 5:30 and get ready to go. I am going by myself.. with my 3 little dogs, 2 Chihuahuas and a Boston Terrier mix... Chico, Peanut and Susi Q.
I leave late,of course,at 8:30 instead of 7:30. I remember the leashes, the cell phone and the camera. Also have directions and my file on what to see in the area. I want to check out the Natural Bridge area and then drive back to Lexington and take a ton of pictures there too. I got some really GREAT pictures of the circle of stones called Foamhenge. It really is impressive! The name Foamhenge is an adaptation of the "Stone" in Stonehenge. The stones are actually made of huge blocks of foam! The dogs and I climb the hill to Foamhenge and I take pictures and then my (new) camera tells me it is full! That's when I remember that I left the memory stick on the counter at home.! So I told the dogs we would just have to stop at a camera store in Lexington and buy a memory stick! I am Woman! I can solve anything! Yea right! As I was putting the dogs back into the van after THEIR potty break I realized I desperately needed a potty break too! I hadn't passed any McDonalds on the way so I figure I had better just find anything available. About 1/2 mile up from Foamhenge I saw the Natural Bridge Zoo. Pulled in and the sign said no bathrooms available unless you pay for admission to the zoo. That's OK..I will write about the Zoo! AFTER I go potty! That's when I reached for my purse.... no purse..... reached again.. looked....and looked.. no purse! I had left it home on the counter!! Can't get in to potty. Oh! and I forgot to mention that I left Richmond with less than 1/2 tank of gas figuring I didn't want to lug that full tank of gas up over the mountains.. I would just fill up when I got to Lexington! Not without a purse I wouldn't!!!!!!!! No purse meant no money, no credit cards, no cash, no debit card, no id, no AAA RESCUE ME CARD, no nothing!! Finally stopped at a Ruby Tuesday and ran in and begged could I use their restroom? Yes! Much relieved I returned to the van and counted the change in my ash tray. Quarters, dimes, nickels... Ah! Ha! $6.00 !!!!!!!! Luckily I hadn't cleaned it out lately at McDonalds. Can you tell I go there frequently? Of course gas prices have gone up lately.. I found an Exxon station up the road and gave the lady my $6.00 in a paper bowl that was in the floor of the van. I bet not everyone comes up to prepay their gas with change in a paper bowl! Then the lady comes out and says "Go ahead and put $4.00 more in there.. I will loan it to you... I mean give it to you..."
I found out her name is Frannie and I told her I would immortalize her on my Natural Bridge web site. THANK YOU SOOOOOOOOO VERY MUCH FRANNIE! I will return it soon! If it hadn't been for her I would not have made it home. The doggies and I would have been walking home!! Whew! 3 hours out and almost 3 hours back and I didn't get to explore much because I didn't have enough gas!!! Hopefully my next trip to the Natural Bridge will be a little better! I will definitely stop and see Frannie and refund her $4.00! I have to say that while I had been told by friends that folks in this part of the country are REALLY nice I experienced it first hand. While I didn't get a chance to see very many people on my short and stressed trip everyone I did encounter was very cordial. Thank you and I will be back soon and many more times! The motto of this story is to make a list and check it to see that you brought EVERYTHING!